The Monastery of Koultoumousiou celebrates the Transfiguration of Christ on the 6th of August. It was founded by Saint Koultoumousi at the end of the 13th century. The Monastery is locatedsouthwest of Karyes at a distance of 500 meters First dean of the Monastery was the emperor Alexios I Comnenos. The first historical proven indication relating to the existence of the Monastery dates back to 1169 and comes from Isaias, the abbot of the Monastery Koultoumousiou. 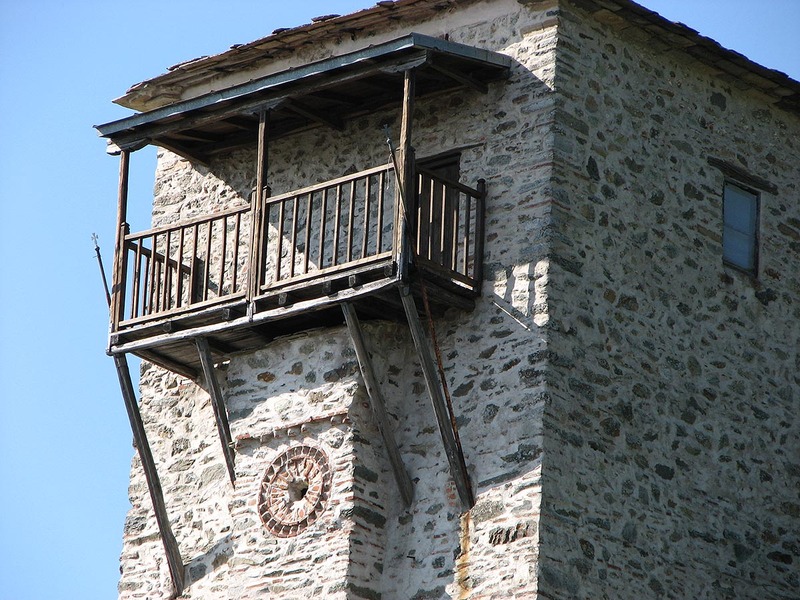 In 1334 in order to increase the revenue of the Monastery, the Monastery Philadelfou and in 1428 the Monastery Alypiou were annexed to it from the head supervisor Isaak. In 1766 the Patriarch of Alexandria Mathaios was a monk in the monastery Koultoumousiou, who restored it and devoted all his assets to it. The Monastery received many attacks from bandits and pirates in the 12th and 13th century and from Catalan mercenaries in the 14th century. In 1497 due to fire there were serious disasters but thanks to the help of the ruler of Wallachia Radoul the Great, who offered resources for the reconstruction of the buildings and for the erection of the large tower in 1508. Help also came from Voivode Neagu for the completion of the reconstruction. 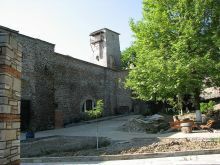 In 1767 again due to fire the east wing of the Monastery was destroyed. The damage was repaired with the help of the Patriarch of Alexandria Matthaios III. 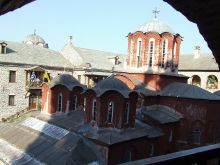 In 1857 and 1870 it survived the fires thanks to the help of Greek bishops. The recent disaster of this kind happened in 1980 with the destruction of the east wing which burst into flames. 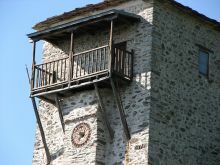 The Monastery prospered in the late 14th century when abbot was Chariton, who asked the financial support from the rulers of Serbia and Bulgaria. 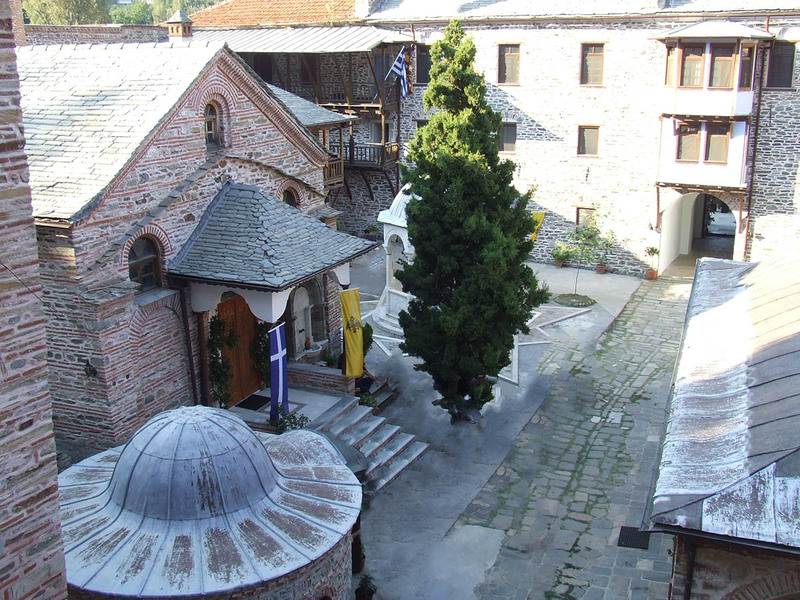 One of the generous benefactors of the Monastery Koultoumousiou was the Prince Ioannis Vladislavos who took care of almost all expenditure of the reconstruction. 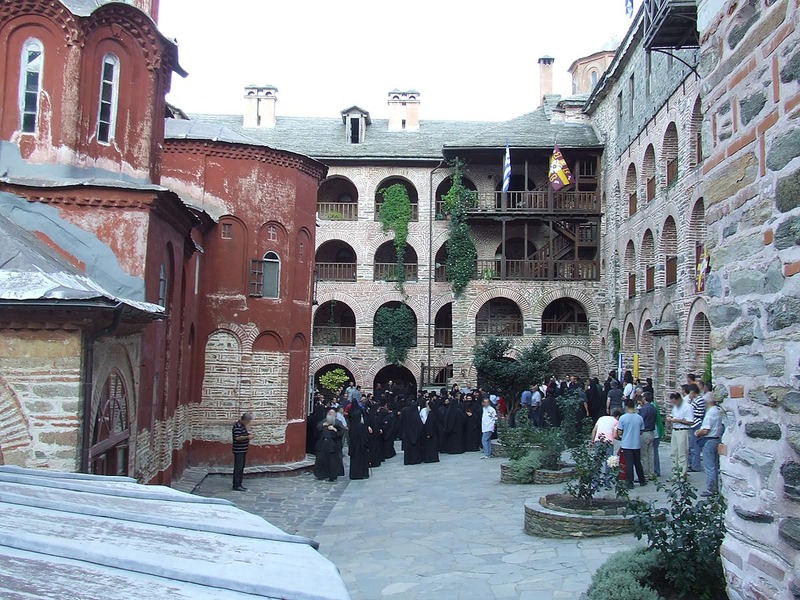 Patriarch Antonios when the monastery began to acquire reputation, proclaimed it 'patriarchal' and 'stauropegic'. Financial support was given by Romanian sovereigns and continued until 1861. The jurisdiction of the Monastery Koultoumousiou ranges to 18 Cells and 3 Hermitages, and also owns the nearby Sketi of Agios Panteleimonas. The Katholikon dates back to 1540 and is honored in the name of the Transfiguration of Christ (6th August). The murals, works of painters of the Cretan School, date back to the same period. Left of Lyti the chapel of the Virgin Mary is attached. In the library there are over 3,500 printed books, over 350 manuscripts and 100 illustrated scrolls and the code ap.60 of 1711. 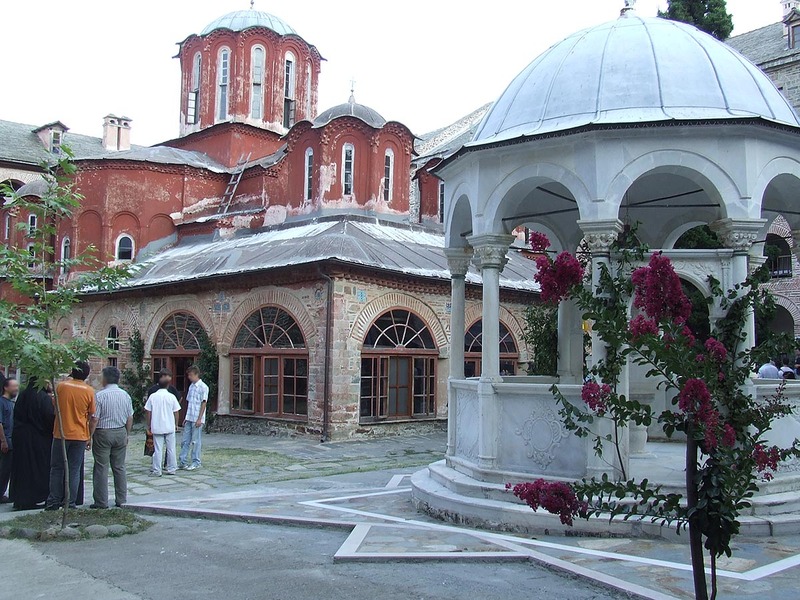 The Prothesis dates back to the 18th-century, while the Stoup and the belfry, independent of the Katholikon, are from the 19th century. In the sacristy there are precious canonicals and objects of great value, relics of saints as those of Agios Gerasimos (+1812) which were rescued from all the fires, part of the remains of Agios Panteleimonas, the left leg of Theometor Anna, the left hand of Grigorios Theologos and the chin of Saint Charalampos. 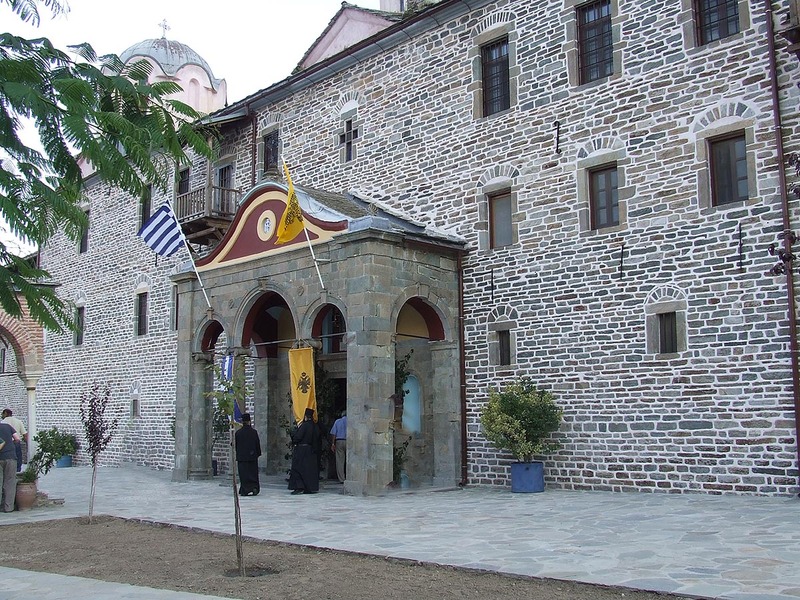 There are 100 portable pictures, a picture of Virgin Mary transferred since 200 years ago to the chapel of the Katholikon in Akathistos and which has remained intact during the fire of the Metochi of the Monastery in Crete. A similar picture, a gift of Alexios Comnenos, is located in the Prothesis and it is taken out for public adoration on the 6th of August, as part of the celebration. One of the most precious pictures however of the Monastery Koultoumousiou is the miraculous picture of 'Foveras Prostasias' which is considered indissoluble by the flames since it has survived after so many fires. 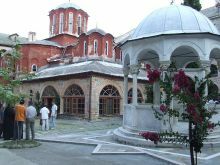 Integrated in the exonarthex is the chapel where the miraculous picture of Foveras Prostasias (Mighty Protection) is situated. It is considered protected by flames after having survived so many fires. Its origin is probably Cretan and according to tradition, once when pirates attacked the Monastery, the Virgin Mary sent a thick mist which forced the startled aggressors to back off and leave.